AirMet Metal Works Custom made decorative Iron Gates, Railings, Fireplaces, Balconies. Iron is the second most abundant metal and the easiest to extract. Its greatest concentration is at the Earth’s core and makes up 34% of its entire mass. The high degree of iron in our planet’s content may contribute to the Earth’s magnetic field. The inner core probably consists of iron crystal or a combination of iron and nickel. Iron rarely exists in its free elemental state and must therefore be extracted from iron ore. Elemental iron is obtained by a process of reducing the chemicals within the ore. 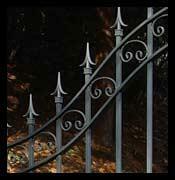 When referring to iron and its history, wrought iron is the form that is most often referenced. It is indispensable due to its ease of extraction and high strength with steel being its best-known alloy. The Iron Age signifies a stage where iron was the predominant material used in the making of tools and weapons. The transition from bronze to iron occurred rapidly due to the obstruction of the tin supply which was possibly caused by mass migration and warfare. This change effected parts of the world at varying times and its beginning is generally noted to be around 1200 BC in Greece and the Ancient Near East. Middle Eastern people used a process known as carburization to add carbon to the irons. This led to the production of wrought iron with the characteristically hard steel surface. At this point in time, iron was harder, less brittle, more abundant and cheaper than the bronze it was replacing making it the most commonly used metal. During the Middle Ages, bloomeries became the source of refining the iron. Bloomeries originally produced this iron using charcoal-heated smelters. Charcoal was used to cover the ore while air would be blown onto the lit charcoal. The additional heat ultimately melted and reduced the ore. As it melted it also released carbon dioxide. This method did not melt the ore completely so a spongy mass remained. These remains were called iron bloom from which the process gets its name. The bloom, containing iron and silicates from the ore, was then pounded and twisted by a blacksmith with an anvil in order to break off the pieces of slag and impurities. This process of working the iron is what ultimately led to the name of “wrought” iron since “wrought” is actually the former past tense of the word “worked”. Beginning around the 8th century of the Middle Ages, larger furnaces were being built in Spain. This continued through the Frankish and the Holy Roman Empires. When manpower could no longer supply the draft needed by these larger furnaces, waterwheels were utilized to operate the bellows and hammers. Cast iron, which is produced by remelting pig iron and pouring it into molds, took place initially in Sweden from 1150 to 1350 where the oldest known blast furnace was built. By the 1300 and 1400’s, the market for cast iron products expanded due to the growing demand for cast iron cannonballs. Henry VII’s interest in having new ironworks at Newcastle was the reason for the first English blast furnace in 1496. These foundries spread rapidly partly because King Henry hired foreign craftsmen to bring iron casting to England. Years later, the first one–piece cannon was cast in England. These cannons were revered as superior and less costly than others made in Europe and have been credited as being a major factor in England’s 1588 defeat of the Spanish Armada. From the medieval period, use of ironwork for decorative purposes became more common. Iron was used to protect doors and windows of valuable places from attack from raiders. It was also used for decoration as can be seen at Canterbury Cathedral, Winchester Cathedral and Notre Dame de Paris. Armour also was decorated, often simply but occasionally elaborately. From the 16th century onwards, ironwork became highly ornate, especially in the Baroque and Rococo periods. In Spain, elaborate screens of iron or rejería were built in all of the Spanish cathedrals rising up to nine metres high. In France, highly decorative iron balconies, stair railings and gateways were highly fashionable from 1650. Jean Tijou brought the style to England and examples of his work can be seen at Hampton Court and St Paul’s Cathedral. Wrought ironwork was widely used in the UK during the 18th in gates and railings in London and towns such as Oxford and Cambridge. In the US, ironwork features more prominently in New Orleans than elsewhere due to its French influence. During the 18th century in England, diminishing wood supplies led to the use of the fossil fuel, coke, as an alternative heat source to wood. Pig iron became the result of smelting iron ore with coke and limestone in a blast furnace. A process known as “puddling” used pig iron to produce a malleable and low carbon steel or wrought iron in a blast furnace. In 1784, Henry Cort’s successful puddling process was patented. The development of these techniques laid the groundwork for the tremendous increase in iron production leading us into the Industrial Revolution that began during the late 18th to early 19th centuries. It was now possible to process wrought iron in large batches. Bloomeries became obsolete and Britain no longer had to rely upon imported iron from Sweden and Russia in order to supplement its needs. As iron became more common, it became widely used for cooking utensils, stoves, grates, locks, hardware and other household uses. From the beginning of the 19th century, wrought iron was being replaced by cast iron due to the latter's lower cost. However, the English Arts and Crafts movement produced some excellent work in the middle of the 19th century. In modern times, much wrought iron work is done using the pneumatic hammer and the acetylene torch. A number of modern sculptors have worked in iron including Pablo Picasso, Julio González and David Smith. In the United States, iron production is primarily from oxide ores. Hematite ores were mined for many years in the Mesabi Range near Lake Superior. Since these supplies have become increasingly depleted, iron is now produced from low-grade ores. These ores are treated with a process called beneficiation in order to improve their quality. Iron has also been refined further to make steel with the Bessemer process which was the first commercial–scale steel production process. The more recently used technique is the basic oxygen process which is faster, produces less air pollution and its major byproduct is carbon monoxide which can be used as a fuel in other applications. The value of a custom made decorative wrought iron fence goes beyond privacy, security and safety. A custom wrought iron decorative fence from AIRMET adds lasting beauty and charm to your home and property. Please take a moment to click on the categories below and see how our clients' property has been enhanced by framing the views of their property in ornamental wrought iron. Click here to receive available home listings.